Nevada is the only state where casinos may be built on land with virtually no restrictions. Nevada casinos may offer almost any table game or slot machine. There are over 70 poker rooms in Nevada. California is the only state that has more poker rooms. There is no bet limit in Nevada. Poker rooms may spread any game in cash game format as long as there are enough players. There is a list of approved games for tournaments, though all common games are on this list. 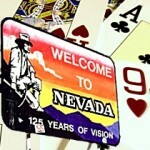 Online poker is legal in Nevada. It was the first state to approve online poker and the first state where it went live. Ultimate Poker, a subsidiary of Station Casinos, launched its real money online poker room on April 30, 2013. The poker room is available to any player that is located within Nevada at the time of play. WSOP launched in September 2013 and quickly became the largest Nevada online poker site. Real Gaming went live in February 2014. It is a subsidiary of South Point. It is still in testing and offers few games at this time. Poker is not the only online game legalized in Nevada, online and mobile sports betting is also legal. Ultimate Poker was the first poker site regulated in Nevada. Players may make a deposit at any Station Casinos cage. Credit cards and bank transfers are also accepted. Players may make a deposit before traveling to Las Vegas so that they may play immediately upon arrival. New players receive a 100% up to $500 first deposit bonus. The bonus clears at a rate of $50 for every $200 in rake paid. Ultimate Poker’s software is very simple. Waitlists, notes and hand histories do not exist. Texas Hold’em, Omaha and Omaha High/Low are available. There are no immediate plans for other games. WSOP offers new players a 100% up to $400 first deposit bonus. It releases in $10 increments for every $50 in rake paid. Players may choose from Texas Hold’em, Omaha, Omaha High/Low, Seven Card Stud and Seven Card Stud High/Low. Players may deposit using credit cards, bank transfer or Neteller. WSOP spreads many satellites to its World Series of Poker events at Rio. Real Gaming only offers No Limit Texas Hold’em. It does not offer a first deposit bonus. Its only promotion is 1% rake tables, which is the equivalent to receiving 80% rakeback at other sites that typically charge 5% rake. All Nevada sites require a cell phone to play. The cell phone reports the location of the player to a verification service. Players within one mile of the Nevada border are unable to play. Some cell phone providers do not participate in the verification, especially small out-of-state companies. Players should make sure their cell phone provider is accepted by the poker site. If they are not, a player will need to buy a temporary phone in Nevada through a major provider to play. Where Can You Play Live Poker in Nevada? There are over 70 poker rooms in Nevada. Las Vegas has about three-quarters of these poker rooms. The remaining rooms are located in Reno, Primm, Carson City, Pahrump, Mesquite, Laughlin and West Wendover. There are some very small poker rooms in other cities. Our partner site at PlayingPokerLive.com has some extensive listings on the most popular Las Vegas poker rooms as well. Venetian – The Venetian is the largest poker room in Las Vegas. It offers players 59 tables and that does not include the additional tables added at Palazzo during the Deep Stack Extravaganza tournaments. Players will find the widest variety of poker in the world at Venetian. In addition to the usual Texas Hold’em games, Pot Limit Omaha, Fixed Limit Omaha High/Low, mixed games and Open Face Chinese are often found. There are also a number of large tournaments offered daily. Venetian will spread any game if there are enough players. Bellagio – There are 39 tables in Bellagio’s poker room. A wide variety of games may be found there. No Limit and Fixed Limit Hold’em is common, but players can also find high limit games of Seven Card Stud and Omaha High/Low. Bobby’s Room, named after Bobby Baldwin, offers high limit games with a minimum buyin of $20,000. Bellagio spreads one daily tournament. Wynn – The Wynn poker room spreads 26 tables. Most games are No Limit Texas Hold’em. There is also one daily tournament. A 4.8 Limit Hold’em game may also be found during peak hours. Aria – Aria is a 24-table poker room that is even bigger during peak season. No Limit Hold’em and Pot Limit Omaha are the two most common games found at Aria. Ivey’s Room, named after Phil Ivey, is the high limit area where players may find nosebleed games such as 25/50 No Limit Texas Hold’em, 200/400 Fixed Limit and mixed games. Some lower limit mixed games are also offered. Aria has two daily tournaments. Red Rock – Red Rock is a 22-table poker room located in the Summerlin suburb of Las Vegas. Fixed Limit and No Limit Texas Hold’em are the most available games. Omaha High/Low may also be found. Red Rock is by far the most popular off-strip Las Vegas poker room. Lake Tahoe – Harvey’s, Hyatt Regency, Lakeside Inn and Montbleu all have poker rooms on the north and south ends of Lake Tahoe. Each casino offers low limit Texas Hold’em and low buyin tournaments. Laughlin – Laughlin is located on the southern tip of Nevada. There are four poker rooms located in Laughlin. They are Colorado Belle, Golden Nugget, Harrah’s and Riverside Casino. Mesquite – Mesquite is located just across the state line from Arizona and Utah on I-15. There is only one poker room in Mesquite. Eureka is a five-table poker room that spread mostly low limit Texas Hold’em. Pahrump Nugget – The Pahrump Nugget is the only poker room in Pahrump. It offers players four tables and spreads mostly low limit Texas Hold’em. Reno – Reno is the second largest city in Nevada. There are ten poker rooms located in Reno. The Peppermill is the largest with 19 tables. Atlantis offers players 11 tables.